Beowulf is the first English literary masterpiece and one of the earliest European epics written in the vernacular, or native language, instead of literary Latin. The story, accessibly retold by Beowulf for Beginners, survives in one fragile manuscript copied by two scribes near the end of the 10th or the first quarter of the 11th century. Until quite recently, most scholars thought that this surprisingly complex and poignant poem was written in the 8th century or earlier, but Kevin Kiernan stirred up controversy in 1981 with the publication of Beowulf and the Beowulf Manuscript (rev sub edition 1997) by asserting that the work was composed in the 11th century, and that the manuscript itself may have even been the author’s working copy. The manuscript was badly damaged by fire in 1731, and its charred edges crumbled over time, losing words on the outer margins of the leaves. Finally, each leaf was carefully pasted into a frame to stop this process. Of course the frames and the paste holding them in place obliterated a little more of the text! Fortunately, many of the lost words were recovered from a copy made before the manuscript deteriorated. Today, ultraviolet light and other technologies used in the Electronic Beowulf reveal erasures, text under the frames, and other characteristics of the manuscript that were previously undetectable. The Beowulf manuscript is now a highlighted collection item in the British Library. The manuscript was made accessible to all by The Electronic Beowulf Project. It was once owned by Sir Robert Bruce Cotton, an “antiquary” or collector of Anglo-Saxon Charters and manuscripts. His library was one of three foundation collections brought together by the creation of the British Museum in 1753. Sir Robert bound Beowulf with four other MSS in a combined codex known as Cotton MS.Vitellius A.xv, the 15th item on the first shelf of the “press” of manuscripts under the bust of Emperor Vitellius in his library. Other manuscripts in the Cotton Library were also cataloged by their locations in bookcases topped by marble busts of Roman Emperors. The MSS are still referenced by this “emperor pressmark” system. Index and Guide to The Electronic Beowulf. Kevin Kiernan, Univ. of Kentucky. 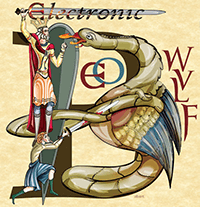 A comprehensive scholarly companion to Electronic Beowulf, 4th edition (online), freely available on the same website. Cotton Vitellius A. XV. Kevin Kiernan. Illustrated overview of British Library MS Cotton Vitellius A. XV, the composite codex containing the Beowulf manuscript. Follow the link to the Nowell Codex, which contains five items, including Beowulf and Judith. Screenshots are very clear and large. Part of the Electronic Beowulf Index and Guide. Digitised Manuscripts: Cotton MS Vitellius A XV. British Library. Contains the Nowell Codex (ff. 94r–209v), which includes Beowulf (ff. 132r–201v), along with the Southwick Codex and some other items collected by Sir Robert Cotton. Beowulf on Shmoop. 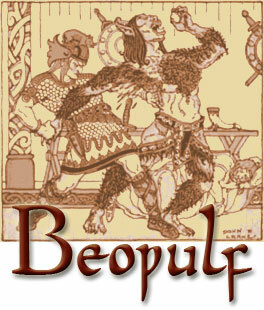 Shmoop organizes many types of information about Beowulf for students and teachers. The writing is informal and fun, though written by academic contributors. If you think Beowulf is boring, explore this site and be prepared to change your mind. Part One: Thorkelin’s Discovery of Beowulf. Kevin Kiernan. From The Thorkelin Transcripts of ‘Beowulf’, Anglistica XXV (Copenhagen: Rosenkilde and Bagger, 1986), pp. 1-41. The Thorkelin Transcripts are important because they give us readings from Beowulf that were lost to fire damage (1731) and provide insight into the origins of the first printed edition of Beowulf by Grímur Jónsson Thorkelin (1752-1829). Thorkelin was primarily interested in Danish antiquities, and discovered Beowulf while conducting research at the British Museum. Part Three: The Reliability of the Transcripts. Kevin Kiernan. From The Thorkelin Transcripts of ‘Beowulf’, Anglistica XXV (Copenhagen: Rosenkilde and Bagger, 1986), pp. 97-151. There are two Thorkelin Transcripts, one of which was made by an amanuensis, and the other by Thorkelin himself. Guess what! The transcripts are not quite the same. Read the article to find out which one is more reliable. Digital Preservation, Restoration, and Dissemination of Medieval Manuscripts. Presentation by Kevin S. Kiernan, Professor of English, University of Kentucky and director of the Electronic Beowulf editions and Electronic Beowulf Index and Guide. Kiernan also wrote Beowulf and the Beowulf Manuscript (1981, rev sub 1997) and “The Eleventh-Century Origin of Beowulf and the Beowulf Manuscript,” in The Dating of Beowulf, ed. Colin Chase (1981). Calligraphy and Illumination Links (Scribal Arts). If you have ever wondered how scribes created manuscripts, or wanted to find some examples of beautiful illuminated manuscripts from the later medieval period, visit this site. Medieval Illuminated Manuscripts: Online Images and Resources. Robert Miller, University of Maryland. College and University Library News, [Online], 78.6 (2017): 334. Web. 10 Jun. 2017. Extensive guide to online collections and and websites. Beowulf Bibliography 1990-2012. Kevin Kiernan, University of Kentucky. This bibliography is an important and current resource for Beowulf scholarship. Use it! Beowulf for Beginners. A delightful re-telling of the story for children of all ages, with illustrations and notes. Written by Helen Lynch and designed by Helen Lynch and Susan Dunbar. Readings by SAJ Bradley. From the University of Aberdeen. Beowulf: Characters. Meet the cast so you can distinguish between all the names that start with “Hr” or end in “theow” and “gar”. argh! Honour, Exchange and Violence in Beowulf (hardcover ed. only). Peter S. Baker, 2013. Examines violence as an essential element in the heroic system of exchange. In Beowulf’s northern European culture, violence was not stigmatized as a breakdown in social order but seen as a reasonable way to get things done. The Origins of Beowulf. Richard North, 2007. Published to Oxford Scholarship Online, January 2010 (abstracts only; full-text access restricted to institutional or personal subscribers of OSO). North suggests that Beowulf was written in 826-7 by Eanmund, Abbot of Breedon on the Hill in NW Leicestershire, as a requiem to Beornwulf of Mercia by Wiglaf, who ruled after him. Old English at the University of Virginia. Peter S. Baker, Univ. of Virginia. Pronunciation practice, glossary, fonts, software, and more. Ravensgard Anglo-Saxon Culture. Links to resources about language, literature, archaeology, Norman Invasion,and related topics. TOEBI. Teachers of Old English in Britain and Ireland. Has a collection of teaching resources. Old English Aerobics Glossary. Look up Old English words. Search options and a keyboard for special characters make it user-friendly. Part of the Old English Aerobics site at the University of Virginia. Anglo-Saxon Aloud. “A daily reading of the entire Anglo-Saxon Poetic Records, which includes all poems written in Old English.” Michael D. C. Drout, Wheaton College. Listen to several MP3 excerpts of Beowulf or purchase a 3-CD set of the entire poem from Beowulf Aloud. There is also a 2-CD collection of Anglo-Saxon Aloud Greatest Hits. Old English Glossary for Beowulf and the Finnesburh Fragment. Click a letter or ligature on the right side of the page to see a matching list of words. Benjamin Slade, Beowulf on Steorarume. Old English Online: Master Glossary. Jonathan Slocum, University of Texas at Austin, Linguistics Research Center. A Guide to Old English. Bruce Mitchell and Fred C. Robinson. Now in its eighth edition, this comprehensive guide for the beginning student offers examples from literature from simple to complex along with the philology. One reviewer noted an issue with non-displayed characters, so download a sample before purchasing the Kindle version. Introduction to Old English. Peter S. Baker, University of Virginia. The third edition of this title, in paperback and for Kindle, is notable as an accessible and innovative text for beginning students. Download a sample before purchasing the Kindle edition. The author also has online Readings from Beowulf and more information at Old English at the University of Virginia. Drout’s Quick and Easy Old English. Michael D. C. Drout, Wheaton College. For beginning students, with exercises to reinforce learning. Kindle edition available from Amazon. Old English Phrases for the Traveler to Anglo-Saxon England. Mary K. Savelli. A short “learn by example” phrase book. Great fun for those with a basic understanding of OE writing and pronunciation. Circolwyrde Wordhord. Curious collection of modern concepts expressed in Old English. For example, ymbsceawere = browser; wyrm or budda = bug. Beowulf. Translated by Francis B. Gummere, 1910. Free from the University of Virginia Library Electronic Text Center. Beowulf. The Gummere translation from the Internet Medieval Source Book. Beowulf. Interlinear text with Old English and Gummere translation. University of Toronto. Beowulf in Anglo-Saxon. From the Internet Sacred Text Archive. For a better understanding of the text, first published in Klaeber’s 1922 edition of Beowulf and the Fight at Finnsburg, view the entire book with several download options from Internet Archive. Beowulf: A New Verse Translation. Seamus Heaney. Bi-lingual edition by Nobel Laureate. 2000. Seamus Heaney on Beowulf and his verse translation. Hear Seamus Heaney read his translation of Beowulf (YouTube audio, Parts 1 and 2). Beowulf – Second Edition (Broadview Editions). Roy M. Liuzza. 2012. Preview on Google Books. Highly-acclaimed verse translation, especially for students. Extensive supplementary materials. The author has a Beowulf Study Guide at the University of Tennessee, Knoxville. Beowulf: A Translation and Commentary. J.R.R. Tolkien. 2014. Tolkien made this translation in 1926 but did not publish it. His son, Christopher Tolkien, edited the manuscript and added a great deal of commentary. Reviews describe this prose translation as readable and accurate. The book includes Sellic Spell, Tolkien’s imagined folk-tale behind the Beowulf story. Klaeber’s Beowulf. Fourth edition. 2008. A standard, first published in 1936. “A revised Introduction and Commentary incorporates the vast store of scholarship on Beowulf that has appeared since 1950.” The text preserves the flavor of the original, but is “lightly revised” to incorporate more recent textual criticism. Beowulf: An Imitative Translation. Ruth P. M. Lehmann. 1988. Preview on Google Books. The Adventures of Beowulf. Free verse translation/adaptation by David Breeden. The Collected Beowulf. Illustrated by Gareth Hinds. Beautifully-drawn graphic novel originally published as 3 comic books. Based on the Gummere translation. Compare sample pages from two editions. Inexpensive signed copies are available from the author’s website. Reviews of both editions are on Amazon. A Parody by Tom Weller, from Cvltvre Made Stupid (Culture Made Stupid), 1987. J.R.R.Tolkien’s Beowulf and the Critics. A critical edition of Tolkien’s lecture series on “Beowulf and the Critics”, edited by Michael D. C. Drout, Wheaton College. Tolkien’s famous 1936 essay, “Beowulf: the Monsters and the Critics” was based on these lectures and published posthumously by his son, Christopher Tolkien. Beowulf: A New Verse Rendering. Douglas Wilson’s poetic version of Beowulf is not a literal translation, but a new alliterative version that attempts to preserve the drama and energy of the original poem. There are several excerpts from positive and enthusiastic editorial reviews on the Amazon page. Grendel’s Mother: The Saga of the Wyrd-Wife. Susan Signe Morrison. 2015. The tale of Brimhild and her defamed son Grendel. She is not a monster, but a healer and seer who sees Beowulf and his brutal men as a menace to the people of Heorot, who adopted her when she mysteriously floated to their shores as a baby in salt-encrusted blankets. Visit the book’s website for the fascinating backstory and links to buy the book. See an editorial review at Kirkus or Amazon. Grendel. John Gardner. 1971. A novel that tells the story from Grendel’s viewpoint. Available in paperback or in the library. Eaters of the Dead. Michael Crichton. 1976 (and newer editions). Based on a historical (922 A.D.) commentary by Ibn Fadlan, representative of the ruler of Baghdad, who crosses paths with some scruffy and barbaric Viking warriors in the valley of the Volga. Crichton added a meeting with Buliwyf, a Viking chieftain who must return to Scandinavia to save his country from the monsters of the mist. It’s hard to find anything in English about Ibn Fadlan, except for James E. McKeithen’s 1979 dissertation (Indiana University), The Risalah of Ibn Fadlan : an Annotated Translation with Introduction. The 13th Warrior. 1999. Based on Michael Crichton’s book, Eaters of the Dead. Antonio Banderas plays Ibn Fadlan. DVD also available from Amazon. Beowulf. 1999. The Beowulf story reset in a grim techno-medieval future. Christopher Lambert, who deserves better, stars as a rather gloomy Beowulf. Strange blend of Mad Max and Excalibur delivers “Beowulf with cheese.” DVD from Amazon. Beowulf. 16 November, 2007. Directed by Robert Zemeckis (Polar Express). Screenplay by Roger Avery and Neil Gaiman. Starring Ray Winstone, Anthony Hopkins, John Malkovich, Brendan Gleeson, Robin Wright Penn, Crispin Glover, Angelina Jolie. This digitally-rendered film uses performance capture throughout. More information and reviews are available at Fandango. In Beowulf vs. the Lord of the Rings, Gary Kamiya contrasts the film with J.R.R. Tolkien’s vision of Beowulf’s mythic significance. Richard North, a Beowulf scholar at University College London, reviews the film for Time Out London. DVD from Amazon. Beowulf & Grendel. 2005. Premiered at Toronto International Film Festival, Sept. 2005; Seattle, 16 June 2006. Directed by Sturla Gunnarsson and written by Andrew Berzins. Gerard Butler plays Beowulf. Filmed on the south coast of Iceland. Treats Beowulf and Grendel as complex characters: “What if the hero was a complex, thinking man? And what if the monster wasn’t really a monster?” DVD available from Amazon. Beowulf: Return to the Shieldlands (TV Mini-Series 2016). The story, written by James Dormer, starring Kieran Bew and Laura Donnelly, is a spin-off tale about Beowulf’s return to Heorot, 20 years after he’d dispatched Grendel. Important: The Amazon DVD is for Playback Region 2 (Europe, Japan, Middle East) and will not play on most DVD players sold in Region 1 (U.S., U.S. Territories, Canada, and Bermuda). About DVD regions. It’s available for streaming from Vudu/Ultraviolet if you want to watch before it’s released on DVD/Blu-ray in the U.S. This ambitious series received mixed reviews and aired for only one 12-episode season. More info at IMDB. Beowulf: The Epic in Performance. Benjamin Bagby, voice and Anglo-Saxon harp, recorded live in Helsingborg, Sweden (January, 2006). “Bagby, accompanying himself on an Anglo-Saxon harp, delivers this gripping tale — in the original Old English — as it could have been experienced more than 1000 years ago.” DVD also available from Amazon. Cotton Vitellius A. xv. Kevin Kiernan. Screenshots and information about British Library MS Cotton Vitellius A. xv, “a composite codex preserving the unique Beowulf manuscript.” Part of the Electronic Beowulf Index and Guide, which facilitates browsing the Electronic Beowulf page-by-page or focused study of the Southwick Codex or Nowell Codex (the one containing Beowulf). [Bibliography: Robert Cotton as a Collector of Manuscripts]. Carl T. Berkout, University of Arizona. For a wider perspective see the author’s Anglo-Saxonists From the 16th through the 20th Century. 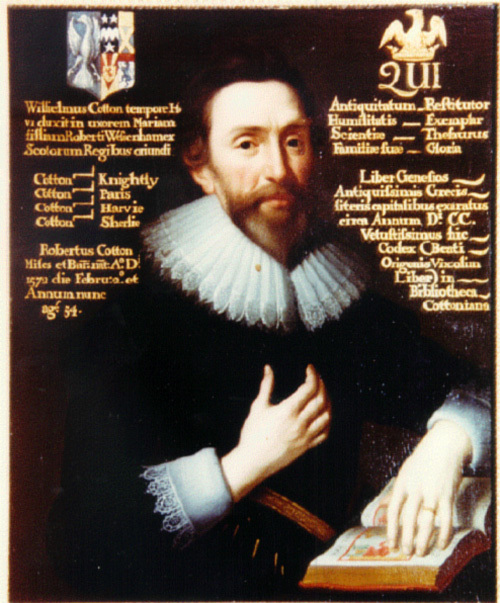 Sir Robert Cotton, 1586-1631: History and Politics in Early Modern England. Kevin Sharpe (Oxford U. Press). 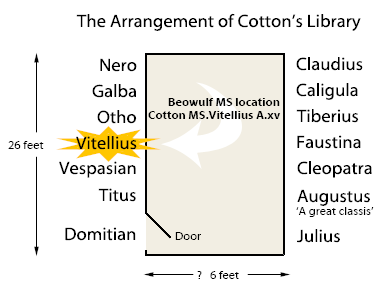 Contains a diagram of the Cotton Library, similar to the one shown at right. More information. ‘Their Present Miserable State of Cremation’: the Restoration of the Cotton Library. Online version of an article by Andrew Prescott, in Sir Robert Cotton as Collector: Essays on an Early Stuart Courtier and His Legacy, ed. C. J. Wright. London: British Library Publications, 1997. 391-454. Sutton Hoo Web Site. The Sutton Hoo Society promotes research and interest in the excavations of Sutton Hoo, a group of burial mounds in Suffolk, England. In 1939 excavations, archaeologists found an Anglo-Saxon ship (80′ long and 14′ wide) containing a rich burial treasure thought to be that of Rædwald, King of East Anglia from 599 to ca. 625 AD, about the same era as the Beowulf story. Objects found here are owned by the British Museum. Sutton Hoo Room. Has pictures of the burial ship and some of the artifacts. The Ship Burial at Sutton Hoo. Accessible, with different pictures than the site listed above. The Staffordshire Hoard. As important as Sutton Hoo, this recent discovery of Anglo-Saxon artifacts contains 3,400 gold and silver objects (at last assessment), and is the largest hoard of Anglo-Saxon gold ever found. Inventory of the artifacts is ongoing, but photos that demonstrate the beauty and research value of the collection are available now. Staffordshire Gold Hoard: Magical Mystery Treasure. “Magical Mystery Treasure, buried in the English countryside. Anglo-Saxon in origin. Who hid it and why?” This article by Caroline Alexander explores the possible purpose of the hoard, why it was buried, and why so many pieces are folded or crumpled. Be sure to view the Magical Mystery Treasure photo gallery by Robert Clark and the Timeline: How Britain Began, with maps showing migrations. Today, December 1998, Vol. 48, Issue 12. The author proposes that some parts of the Beowulf poem took place in North Kent, possibly on Harry Island (“Heorot” in the 11th century, and the name of Hrothgar’s Hall). Unfortunately, only the first part of the article is available free from History Today. Check your library for access to this popular periodical. In 2013, researchers announced that Excavations at Lejre in eastern Denmark, the site of a royal Danish court from the 6th to 10th century, revealed seven feasting halls of various ages, the remains of hundreds of animals, drinking vessels, and about 40 pieces of jewelry. Some scholars believe that the oldest feasting hall on the site may be Heorot. For more information on this ongoing archaeological investigation, see: Secrets of Beowulf Revealed. The Old Norse Volsunga Saga, or Story of the Volsungs, also has a brave hero, Sigurd, who skewers a venom-snorting dragon and gains his cursed gold-hoard. Elements of this story are found in Wagner’s opera, “The Ring of the Niebelung” (Der Ring des Nibelungen) and J.R.R. Tolkien’s symbolic “One Ring to Rule Them All,” in the Lord of the Rings cycle, as well as in Beowulf. See Pre-Christian Epics of Northern Europe for links to resources on Norse (and Irish) Mythology. The original sources are useful to scholars. For the rest of us, look for the translations and check out Neil Gaiman’s new book Norse Mythology for a retelling of the ancient tales by a gifted storyteller. Voice of the Shuttle: English Literature: Anglo-Saxon and Medieval. An overview of major resources on the Web for the Medieval period. Apparently no longer maintained, it has many broken links, but may provide some general direction for students. Archaeology Data Service. Archaeological dataset repository that supports digital preservation of fieldwork records, and their re-use for research, learning, and teaching. Searchable database and project archives. Example of a project record: The Sutton Hoo Research Project, 1983-2001, Prof. Martin Carver, 2004, University of York. Ða Engliscan Gesiþas (The English Companions). Historical society devoted to the study of the Anglo-Saxon period. Hear audio clips of Anglo-Saxon poetry, learn about the language, runes, village life, medieval birds, and more. Regia Anglorum (Historical Resources Section) (Kingdoms of the English). Re-enactment society in the United Kingdom, “founded in 1986, to accurately re-create the life of the British people as it was in the one hundred years before the Norman Conquest.” The Historical Resources section organizes many articles about this time period. MLA International Bibliography (Modern Language Association). The definitive index for scholars. Over two million citations to books, scholarly journals, essay collections, working papers, proceedings, dissertations, and bibliographies from languages, literatures, linguistics and folklore. 1926 – present. Project Muse. Search journals and books from University presses and scholarly societies. Includes some excellent literature journals as well as arts and humanities titles. Full-text access depends on which Project Muse book collections and journal subscriptions your library has purchased. Academic Search Premier. Indexes 12,000+ scholarly journals, with full text for 4,000 titles. Covers social sciences, humanities, education, computer science and engineering, general science, humanities, medicine, ethnic studies, and more. 1965- present for selected titles. Some libraries may have a similar version of this index, such as Academic Search Elite. ERIC (Educational Resources Information Center). If you teach Beowulf, search ERIC for articles and research reports. The mother of all ERIC clones is the government-sponsored open access database started in 1966. Arts & Humanities Citation Index. A citation index covering more than 1,700 titles from the world’s leading arts and humanities journals. Includes the ability to search particular authors’ works to find out who is citing them. 1975 to present. Manchester Medieval Sources. Some academic libraries may subscribe to this resource, which no longer has a publicly accessible area. Provides links to selected resources about Anglo-Saxon culture, including maps, societies and conferences, bede and lindisfarne, beowulf, archaeological sites, everyday life and language. MLA Handbook. 8th ed. Modern Language Association, 2016. An essential reference for writing and formatting research papers in MLA style. If you can, get your own copy. Dictionary of the Middle Ages. 13 vols. 1982-89, and supplements. An encyclopedia with signed articles about all aspects of the medieval period. A wonderful resource. Classical and Medieval Literature Criticism. The “CMLC” is a multi-volume set of reprinted excerpts from scholarly journal articles and books. A great way to get an overview of what scholars have said about a particular work over a long period of time, and to get some differing opinions and approaches. The section on Beowulf is in volume 1. Harner, James L. Literary Research Guide: An Annotated Listing of Reference Sources in English Literary Studies. 5th edition. Modern Language Association, 2008. Essential tool for serious students. Finding books or other library materials about Beowulf in your library’s catalog should be easy. Possible search terms include: beowulf, grendel, anglo-saxon, sutton hoo, anglo-saxon literature, and old english poetry.